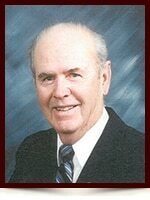 Allan Lee Burton - Edmonton's Burial & Cremation Professionals | Trinity Funeral Home Ltd.
On Tuesday, April 26, 2015 Mr. Allan Burton of St.Albert and formerly of Sundre passed away at the age of 86. Fondly remembered by his children, Diane (Dana Johnson) Burton, Larry Burton. Allan will also be missed by his loving grandchildren, Brandy (Eric Jandrey) Burton, Jesse (Sarah) Mesiatowsky and great-grandchildren, Joe and Ronnie Jandrey, Bella Mesiatowsky. ;sister Mildred Anderson as well as numerous nieces, nephews, relatives and friends. He was predeceased by his daughter Brenda Mesiatowsky in 1998 and by his wife June Burton in 1999 and by his second wife Ruth Burton in 2013. Friday, May 8, 2015 at 2:00 p.m.
Royal Canadian Legion Sundre, Alberta. My sympathy for the family in your loss. I know that nothing I can say will lessen your grief. May the many fond memories of good times give you the strength you need in in your time of sorrow.